In November 2016, Clowns Without Borders Spain traveled to El Salvador to continue its long-lasting mission. In 2011, Clowns Without Borders Spain went to El Salvador to address the children affected by the summer flooding which provokes the displacement of many people. They performed 25 shows for 1897 people. In 2009, Clowns Without Borders Spain went to El Salvador to strengthen the social fabric supporting their counterpart in the launch of an amateur arts company. Altogether they performed 24 shows for 6000 people. In 2008, Clowns Without Borders Spain went to El Salvador. They supported the creation of an amateur company linked to the NGO responsible for development projects. They performed 18 shows for 4200 people. 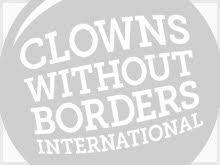 In 2008, Clowns Without Borders Spain went to El Salvador and performed 18 shows for 4200 people. In 2008, Clowns Without Borders Spain went to El Salvador to support the creation of an amateur company. They ended up performing 19 shows for 4150 people. Clowns Without Borders Spain went to El Salvador in 2003 and partnered with Medicos del Mundo and Ayuda en Accion, performing 12 shows for 4000 people. 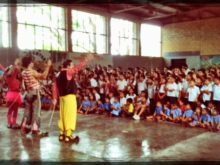 In 2002, Clowns Without Borders Spain implemented a project in El Salvador, with the help of Medicos del Mundo and Ayuda en Accion, performing 12 shows for 4000 people.